Earlier this week, I talked all about the decorating lessons I’ve learned as a first-time homeowner. One of those lessons was to not get carried away planning every single decorating detail in advance of moving in, because it’s really best to slow down and live in your house first before you’ll have a good sense about what decor will work best in your new space. When we moved into our house over a year ago now (hard to believe! ), I already had a binder stuffed with floor plans, color swatches and a checklist of home projects that needed to be done (and when I say done, I meant immediately done). 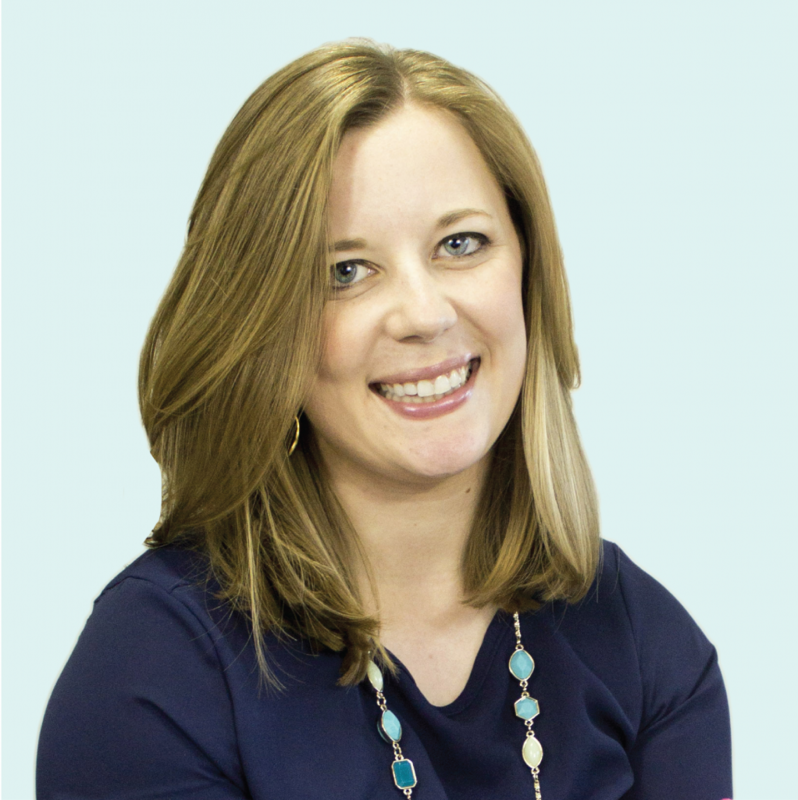 I become an overzealous planner once there’s a new project on the horizon, and I went to the extreme for our first house – after all, it was going to be my most epic project yet! While nearly all of my initial plans have been altered since moving in and taking time to really live life in our space before decorating every square inch, there are a very small number of projects that have ended up exactly how I planned them out. 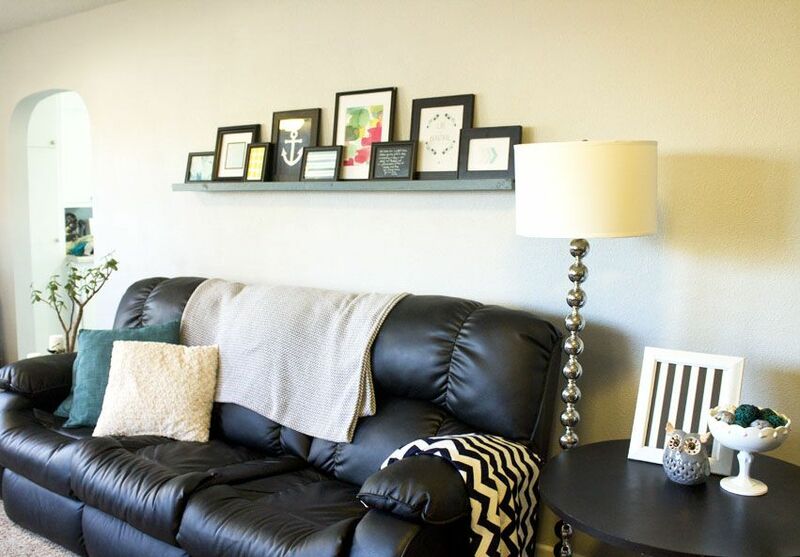 One project that stayed true to my initial vision was the picture ledge that I built to hang above our couch. 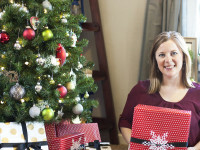 I finished this project a few months ago now, and you’ve already seen glimpses of it in my Christmas living room tour and Valentine’s Day printable art post. 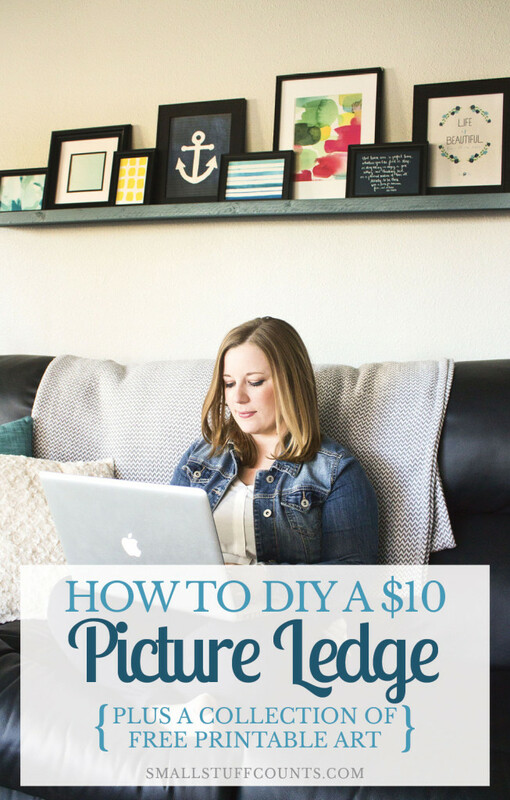 Many of you have asked me for instructions on how I built this DIY picture ledge, and today’s the day I’m finally sitting down to spell it all out for you. First of all, let me explain that I’ve done little woodworking and don’t have a very high comfort level with power tools. Also, the only power tool I own is a cordless drill with a few little saw attachments. But for this project, you don’t need any fancy equipment or construction knowledge. 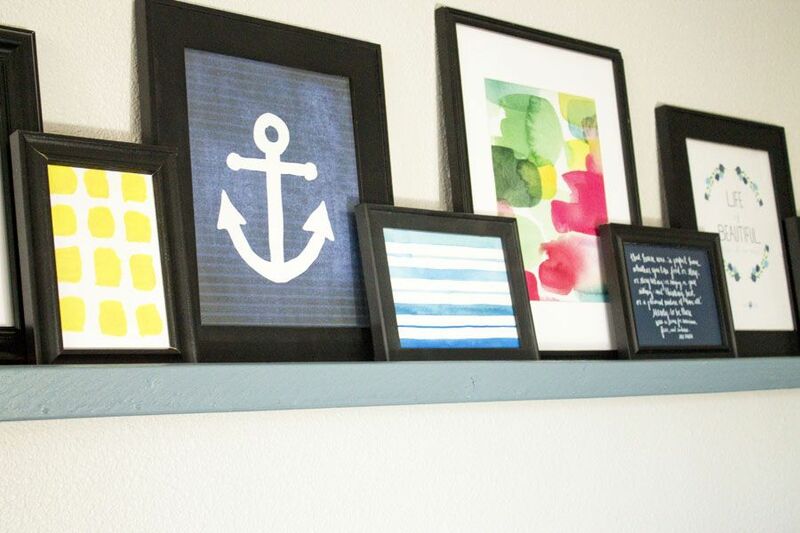 You can totally make this DIY picture ledge on your own! I bought my lumber at our local lumber yard for a grand total of $7.29. That included cutting all three boards down to size. How cheap is that?! For your convenience, this post contains affiliate links for supplies I personally use and recommend. See my disclosure policy here. Tip: When you buy your lumber, ask them to cut the boards to the length you’re wanting. I wanted a six-foot ledge that would span the length of the couch. This project is really easy because all three of your boards are the exact same length. Note: If I was doing this project over again, I would probably make the bottom of the ledge smaller in width. Instead of buying two 1x4s and one 1×2, I would get one 1×4 and two 1x2s. This is because my ledge is quite long so the bottom sags forward slightly after hanging up for a few months. It’s not super noticeable, but my ledge is plenty deep for my frames and a skinnier bottom board would be plenty of room for them. Just food for thought, you can obviously modify this project how you see fit. You should know that I failed as a blogger on this project because I didn’t take any pictures of the picture ledge under construction. Probably because I randomly decided to do this at 10:00 p.m. one night when I had a sudden urge to have a place to display cute Christmas art printables. Also, I wasn’t all that confident that this project would actually turn out into something that looked good. So, here’s the rundown of how I made this picture ledge. I used the little sander attachment that came with my cordless drill to quickly sand the rough edges of the boards. I didn’t spend a lot of time on this, so don’t judge the close-up picture below. Pay extra attention to the ends of the boards and then also sand any other rough spots. If you don’t have an electric sander, you can use sandpaper for this. Now that your three boards are sanded, it’s time for paint or stain. I brushed on a quick coat of paint that was leftover from our kitchen walls. I painted two sides of each board and waited for them to dry before flipping them over and painting the other sides. You could also use a nice wood stain. Take a look at the photo below to see how I assembled my three boards. The 1×2 forms the front edge of the ledge, while the 1x4s are the bottom and back. You’ll want to pay attention to the blemishes in your boards and face the nicest edges toward the front. To attach the boards, I first put a line of wood glue along one edge and then used my drill to place screws every foot (that’s approximate, I didn’t measure any of this). If you don’t have a drill, you could go the old-fashioned route and use a screwdriver. Once the screws were in, I hammered finishing nails in a row between the screws. This helped things stay snug. When you have your boards all screwed and nailed together, let them dry. 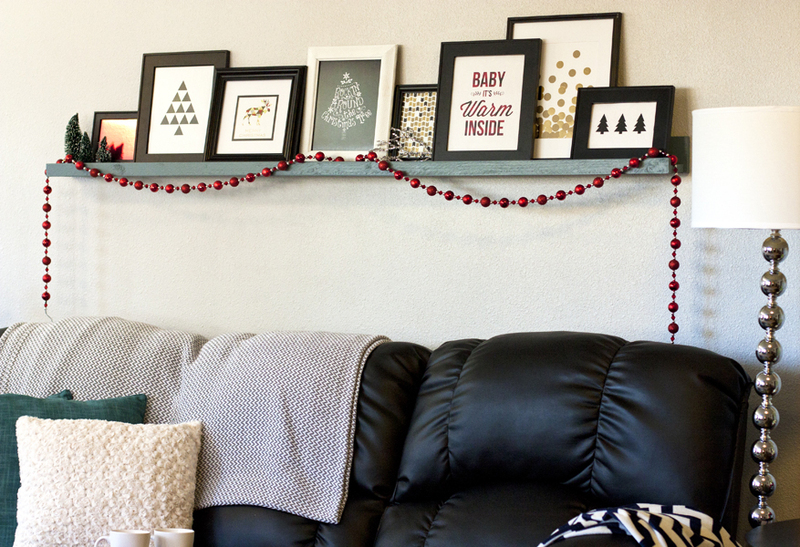 This DIY picture ledge looks so amazing above our couch and it is the perfect place to rotate artwork with the seasons. You’ll have to decide what works best for hanging your ledge on the wall. We have plaster walls and were concerned the shelf would be too heavy to hang on our wall, so we made extra certain it was securely attached. You could probably get by with a few hangers on a different type of wall, but I’ll leave that up to you. We ended up using a stud finder to locate all of the studs behind the ledge. We drilled corresponding pilot holes through the back of our ledge and into the wall, we pounded hefty wall anchors into the holes in the wall, and then we screwed super long screws directly through the board and into the wall. I didn’t worry about filling in the screw holes in the ledge because they would be covered up by picture frames. Please know that we are not pros at this stuff, and I have no idea how someone who was actually handy would have hung up our ledge. But it worked for us! We put several holes in our wall, but that’s okay with me. I don’t plan on moving this ledge for a very long time. I’ve had this picture ledge up for about three or four months now and have already swapped out the art three different times. I already know that these frames are going to be changed out often, which is the beauty of a picture ledge. With very little effort, I can rearrange the frames and switch out the art. This ledge is definitely going to regularly change with the holidays and seasons. After Valentine’s Day was over, I took out all of the black and pink Valentine printables I designed and needed some fresh art for spring. Instead of designing my own printables this time, I went on a hunt to create a collection of freebie printables that other bloggers have shared. 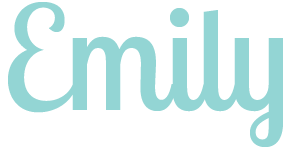 You can snag all of those free printables by clicking the links under the photo below. Thank you so much for stopping by today. I hope you found a cute printable to print out and frame or that you feel motivated to build your own picture ledge. 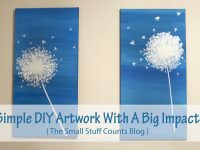 It’s so rewarding to DIY your home decor! Do you have a picture ledge in your house? 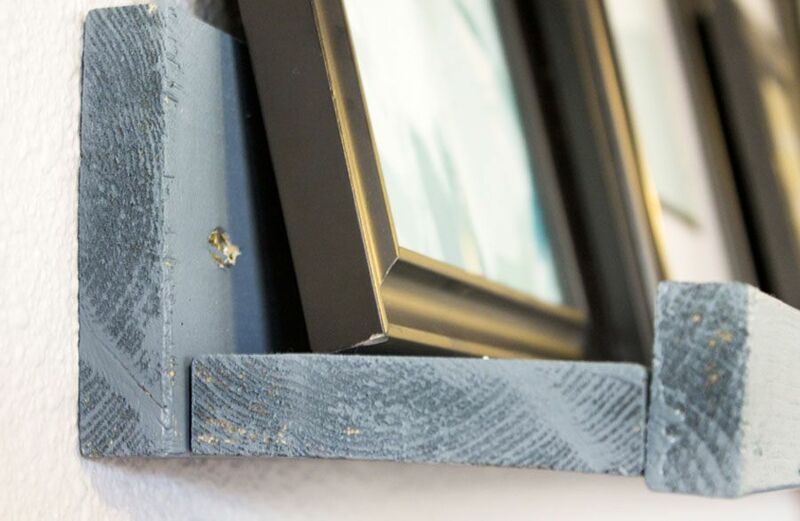 Where do you use ledges to display art? I’m curious to hear how you use them! P.S. If you love printable art, I pin the freebies I find to this Free Printables Pinterest board. Oh, and here are some other views of the picture ledge…. We have two half-walls between our kitchen and living room. When we first bought the house, I didn’t like them. Now I see them as a blank canvas to decorate with every season! 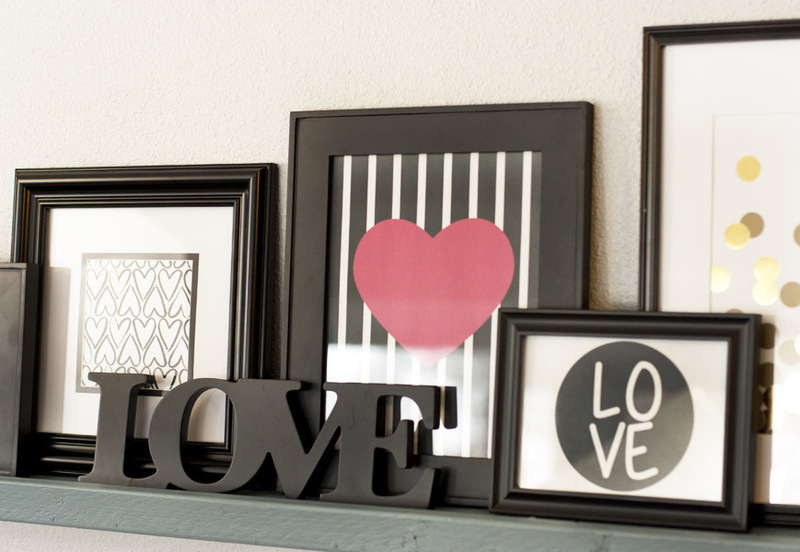 I use printables in frames and other little items to decorate them. That’s awesome you found a way to utilize those half walls! Sometimes a part of our homes perplex us, and it’s always nice to finally figure out a great way to make them useful. 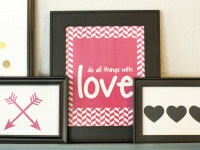 Printables are perfect for switching up the look often. I hope you enjoyed these! Have a terrific day, and thank you so much for visiting!